Freescale Semiconductor has licensed the ARM Cortex-A50 series of microprocessors (MPUs) for future versions of its i.MX applications processor and QorIQ communications processor product lines. The deal is part of a new multiyear subscription license with ARM. ARM recently announced the Cortex-A50 series which is based on the ARMv8 architecture and is capable of 64- and 32-bit execution. The series initially includes the Cortex-A57 and Cortex-A53 processors. The Cortex-A57 processor is ARM’s most advanced high-performance processor, while the Cortex-A53 processor is the most power-efficient ARM applications processor, as well as the world’s smallest 64-bit processor. 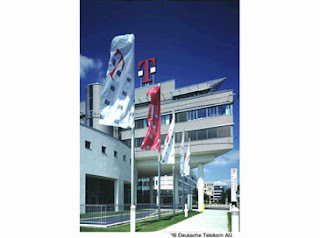 Unlike many of its European competitors, Deutsche Telekom held its net revenue more or less steady, at EUR 58.2 billion. The organic decline in revenue - i.e., adjusted for exchange rate effects and changes in the composition of the Group - was reduced from from 3.6 percent in 2011 to 2.7 percent. The adjusted EBITDA margin for the full year stood at 30.9 percent, a decline of around 0.9 percentage points year-on-year, largely due to the increase in market investments in the German mobile communications market, especially in the fourth quarter of around 27 percent compared with the fourth quarter of 2011. With success: In these three months alone, sales of smartphones increased to a record high of around 1.5 million, and the number of new contract customers under the Deutsche Telekom and Congstar brands increased by 226,000. Ongoing competitive and price pressure and regulatory decisions also had a negative impact on the reduced EBITDA margin. Adjusted net profit totaled EUR 2.5 billion, 11.3 percent less than in the prior year. As of year-end, the reported net loss stood at EUR 5.3 billion, EUR 0.8 billion down from the end of the third quarter of 2012. The loss is almost entirely attributable to the impairment loss recognized in the United States in the third quarter of 2012 of EUR 7.4 billion net. As already explained when the figures for the first nine months of 2012 were announced, this non-cash, purely accounting effect is a consequence of the planned business combination of T-Mobile USA and the competitor MetroPCS. The applicable accounting standards require this impairment loss to be recognized. "This loss of billions is not what it appears to be: We are not lacking in funds to drive forward the development of the Group," emphasized René Obermann. "As we said in December, we want to massively step up investments in the future again, to almost EUR 30 billion for 2013 to 2015." In light of these substantial increases in investments, Deutsche Telekom expects free cash flow of approximately EUR 5 billion for the current financial year, as already announced at its Capital Markets Day in December. In 2013, adjusted EBITDA is expected to amount to around EUR 17.4 billion. Assuming successful completion of the transaction with MetroPCS, the expected adjusted EBITDA would be around EUR 18.4 billion, extrapolated to include MetroPCS for the full year. The number of customers with the Internet-based television service Entertain went up by 27 percent year-on-year to 2.0 million. The mobile contract customer base in Germany grew by 1.3 million in the past year. 569,000 of these were new customers of the Deutsche Telekom and Congstar brands, while the rest of the additions were in the fast growing, but much lower revenue reseller segment (service providers). In Germany, the number of cell phones sold by the company in the full year increased to 5.6 million. The percentage of smartphones, including primarily Android-based devices and the Apple iPhone, increased by 11 percentage points against 2011 to 73 percent. Around 1.5 million smartphones were sold in the fourth quarter of 2012 alone, making it the strongest sales quarter to date. Customer numbers were up at T-Mobile USA for the first time since 2009. The company's customer base grew by around 200,000 new customers compared with the end of 2011 to 33.4 million. At the same time, monthly revenue in this customer group increased by 11.2 percent year-on-year in the fourth quarter to USD 27.7, which is half the revenue of a contract customer. The number of branded contract customers declined by around 2 million in the full year. Despite the global economic situation, T-Systems increased its overall revenues and external business during Q4 2012. The growth is attributed to an expanding number of cloud contracts. 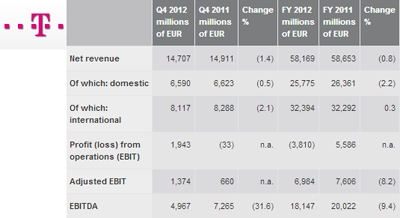 In the 2012 financial year, T-Systems recorded order entry of EUR 8.7 billion, up some 18 percent year-on-year. This encouraging development was driven by major contracts in the fourth quarter with oil company Shell and the state of Lower Saxony. The extension of the contract with Shell for another five years in particular shows that T-Systems has further improved its position in the strategically important market for cloud services. Despite persistent price pressure, external revenue was up 0.6 percent year-on-year at EUR 6.6 billion. Total revenue also increased by 0.6 percent to EUR 10 billion. This increase is due to strong international revenue, which rose by some 6 percent compared with 2011 to EUR 3.2 billion. The company is successfully counteracting the ongoing price pressure in the industry with cost-cutting and efficiency measures and improved its adjusted EBIT margin steadily over the course of the year to 2.4 percent in the fourth quarter of 2012. United Fiber & Data (UFD) has begun construction on a new low-latency, fiber network from New York City and its surrounding areas to Ashburn, Virginia. Founded in 2009, UFD has completed all necessary planning and has secured rights of way for the first phase of construction. UFD is using a diverse route with both logical and physical redundancy built into the design. Sandia National Laboratories is deploying what is described as the world’s largest passive Optical LAN. The network now connects about 13,000 workstations in 265 buildings. Sandia National Laboratories started deploying Tellabs Optical LAN Solution in 2009 to replace an existing copper-based LAN. Tellabs calculates that with the Optical LAN Sandia will save about $20 million in costs over 5 years, once the system is fully deployed. 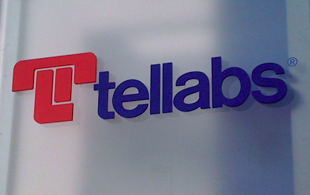 Tellabs is preparing to ship a new Tellabs 120 mini-ONT, the world's smallest enterprise ONT, in the second quarter. The company is also investing in the sales channel to extend its distribution into enterprises. NTT DOCOMO has established a wholly owned subsidiary in Brazil to provide mobile solutions for mainly Japanese corporate customers in Brazil and conduct research aimed at developing new business opportunities in Latin America. The unit is based in Sao Paulo. Raytheon plans to operate as a commercial service provider under the recently expanded Enhanced Cybersecurity Services (ECS) program outlined in President Obama's Executive Order on Improving Critical Infrastructure Cybersecurity. ECS is a voluntary information sharing program that assists critical infrastructure owners and operators as they improve the protection of their systems from unauthorized access, exploitation or data exfiltration. Under a Memorandum of Agreement signed with the Department of Homeland Security, Raytheon will receive active, malicious cybersecurity threat information furnished by DHS. Operating as a commercial service provider, Raytheon will use these indicators to protect the defense industrial base and other sectors of critical infrastructure. "Information sharing and collaboration between government and industry partners is critical to defending our nation against the cyber threat," said Steven K. Hawkins, vice president of the Information Security Solutions product line for Raytheon's Intelligence and Information Systems business. "The Enhanced Cybersecurity Services program adds another layer of cyber resiliency for our nation's most critical resources." Tata Communications Ltd. has selected Allot Communications' Service Gateway solution to provide cloud-hosted policy services to their Mobile Network Operator (MNO) customers. Tata Communications is launching a Hosted Policy Engine, which is a cloud-based solution for policy control. The carrier offers Policy Management and Enforcement solutions as a managed service, hosting it in the cloud to reduce the complexity, cost and timeline for deployment and ongoing operations, making it an attractive alternative for many MNOs. 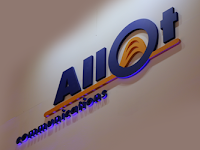 The Allot Service Gateway offers the ability to provide MNOs support for detailed broadband usage analysis; network utilization optimization through congestion management, caching, and video optimization; and differentiated offer creation through agile and powerful policy enforcement.